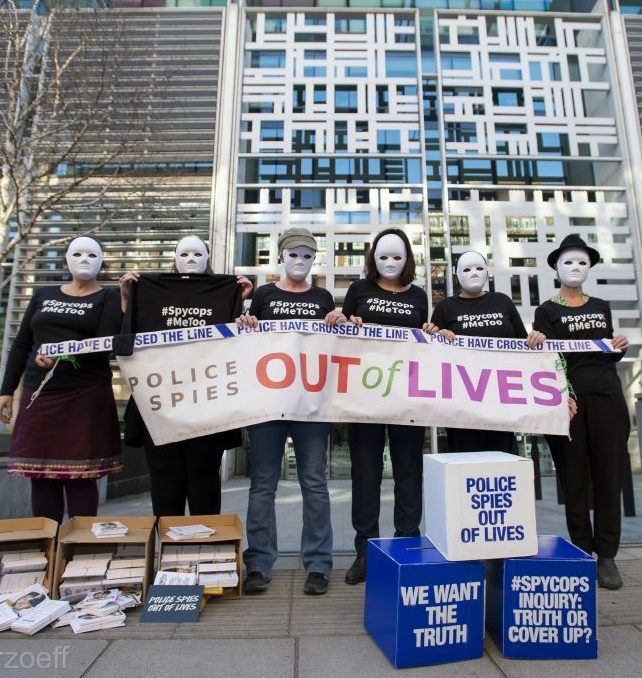 Call for support for Chair of the public inquiry into undercover policing. Wearing masks to protect their anonymity and #Spycops #MeToo T-shirts, women deceived into long-term intimate relationships by undercover police officers visited the Home Office earlier this week. They handed over 6,000 postcards signed by the public supporting their campaign and a letter the Home Secretary, Sajid Javid, published below, calling on him to appoint a panel of advisors to support Sir John Mitting who they consider wholly unsuitable to chair the public inquiry into undercover policing. We have written to the Home Secretary before (19.9.17 and 3.4.18) to explain our serious concerns with the lack of progress and integrity of the Undercover Policing Inquiry. We are women whose human rights were violated by unethical and unlawful police deployments which included deceiving each of us into long term intimate relationships. This Inquiry came about as a direct result of our investigations into the disappearances of our ex-partners and the subsequent revelations of their true identities as Metropolitan Police Service undercover officers. We are central to the setting up and the purpose of this Inquiry yet we do not feel our voices are being listened to. We are deeply concerned that the Chair’s lack of experience and understanding of sexism, racism and class discrimination is leading to a failure to engage with and investigate fully the range and depth of the abuses committed by these secret political policing units. We fear that, in turn, this failure will mean lessons will be missed and such human rights abuses could easily happen again. Our support group, Police Spies Out of Lives launched a partnership campaign with the cosmetics company Lush to draw public attention to our concerns and to invite people to write to you on our behalf requesting additional panel members to assist the Inquiry Chair, Sir John Mitting. We have thousands of postcards we are keen to deliver. When in the past we raised issues about the Chair’s approach and requested that a panel should be appointed, we were told that the Home Secretary will “continue to keep the need for a panel under review”. For the reasons set out below, we believe strongly that now is the right time to reconsider the Home Office’s position both on the appointment of additional panel members and on the suitability of Sir John Mitting. Having met privately with Sir John Mitting to discuss some of our concerns we remain unconvinced that he has some of the skills necessary for the particularity of this investigation. His comments during the private meetings revealed a profound lack of understanding of issues relating to institutional sexism and discrimination. We enclose a witness statement of Harriet Wistrich setting out these comments in detail; this statement was provided as evidence in the recent judicial review challenge of your decision not to appoint additional panel members. Regrettably, the court refused permission for this judicial review to proceed on 7 November 2018. Since this time, new information has come to light which we hope will influence you to reconsider your position. When Sir John Mitting took over chairing the Inquiry, he made a promise that, subject to restriction orders, if during the course of the Inquiry a woman learns she had a relationship with an undercover police officer then she has a right to know that officer’s real name and the Inquiry would inform her of it. He stated that it would then be her decision whether or not to publish that name in the public domain. Sir John Mitting’s intention in this approach has been framed as a moral obligation to the woman concerned. The problem with this approach, however, is its lack of understanding regarding the institutional nature of these abusive relationships. These were not simply intimate relationships between two consensual individuals on an equal footing. The Chair treats the relationships as solely personal interactions; a very similar approach to that of the Crown Prosecution Service which references the ‘genuine feelings’ upon which they believe these partnerships were founded. These positions strip away the context. They remove from the equation the fact that these men were on-duty, publicly-funded, undercover police officers. By giving the responsibility of publishing their real names to the women, the Inquiry is adding to the stress and trauma already suffered. Where two or more women have had a relationship with the same officer, they may not agree whether or not to publish his name. The affected women have suffered enough without this added level of responsibility and distress. The men concerned committed these abuses as serving police officers and they should be held to public account. Subject to restriction orders, therefore, their real names should be published on the Inquiry website and we urge you to affect this change. A recent Supreme Court appeal hearing (24.1.19) has drawn new public attention to a judgement made by Sir John Mitting in 2016 in the case of Stocker v Stocker. This was a defamation case brought by a man against his ex-wife who he had subjected to domestic violence, after she attempted to alert his new partner to the risk of violence. In a Facebook post she referred to her ex-husband trying to strangle her. Sir John Mitting ruled that Ms Stocker was guilty of defamation on the basis of the dictionary definition of ’strangle’, since the husband had asserted he did not intend to kill her and was only trying to silence her. This approach demonstrates a woeful lack of understanding of both the threat and impact of male violence against women. In 2018 the Court of Appeal upheld this judgment. However the case has recently been considered by the Supreme Court (judgment awaited) amidst protests from a range of domestic violence charities who, having become aware of the case, have raised serious concerns about it wider implications. This case has particular resonance for us. We see in this ruling, Sir John Mitting’s reductive approach to interpreting the law. Again, we witness him stripping away the context of the relationships, being blind to their power dynamics and by so doing discriminating against women in his judgments. We do not feel such a person is appropriate to preside over an investigation at the heart of which is discrimination against women, at least not without the assistance of an expert panel who do understand these issues. In the most recent Inquiry hearing (31.1.19) Sir John Mitting referred to himself as a ‘pedantic English lawyer’. The investigation into undercover policing is far too complex to be overseen by a pedant. Sadly, it has again been necessary to complain about insensitive remarks made by Sir John at the most recent public hearing, please see our letter to the Inquiry dated March 20th. It is noteworthy that while over three years has been spent by the UCPI allowing the police extensive latitude in making anonymity applications, and granting a significant number of these on the basis of not wishing to interfere with the officers’ right to privacy, in contrast Sir John Mitting displays little or no concern for the privacy and wellbeing of the victims of police spying. In our case we requested disclosure from the police about our relationships in 2011, but we have not received any documents to date either from the police or the Inquiry. We want to ensure that there is an end to these double standards regarding Article 8 rights. On January 29th 2019, the Inquiry announced there would be a further delay of one year before evidential hearings are to begin. This is likely to mean that provision of the final report is pushed back a year from 2023 to 2024, having originally been set at 2018. This delay alienates already frustrated core participants further, particularly when in meetings with Sir John Mitting, one of the key reasons given for not appointing additional panel members was the delay involved. We were told it takes approximately nine months to pass the required vetting procedures. For the final report to be credible, the core participants and the public must have confidence in the Inquiry process. We ask you, therefore, to use this delay to vet and appoint a panel. By appointing a panel of experts with experience and understanding of institutional sexism and racism, you could contribute to ensuring the final report is a comprehensive and robust account of the truth. The scope of these human rights abuses and how they were allowed to happen must be fully understood if the government wants to ensure they do not happen again with the consequent harm to citizens’ lives and resultant cost to the public purse. We have waited years to discover the truth about our own past and are deeply dissatisfied with the Inquiry’s current status. If it is to regain the confidence of its core participants and the wider public, we believe it is essential the Home Office reconsiders the position of Sir John Mitting and the appointment of additional panel members. Finally, we would like to repeat our request for a meeting with you so that we can express our concerns in person. We are aware you have met with other core participants, in particular the family of Stephen Lawrence and Duwayne Brookes. Given our equally central role to the establishment of the inquiry a meeting with a representative delegation of us would be appreciated. Names in inverted commas are pseudonyms by which we are known to the Public Inquiry.